These two areas¹ of woodland situated on a hill behind Woodborough Hall and adjacent to Bank Hill Farm, belonged to the owners of the nearby Woodborough Hall until 1922, when land and other properties belonging to the Hall were sold off. Colonel Potter of Lambley House purchased both woodlands. Note 1. 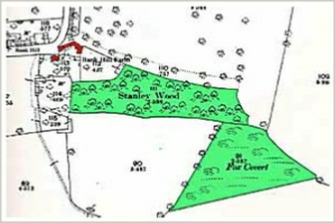 Both the 1895 os map (left) and the 1965 os maps show Stanley Wood having 2.15 acres) and Fox Covert 2.59 acres as two adjoining but separate woodlands, the 1992 os map titles them both as Stanley Wood. Another version of the 1888. also the 1965 and 1992 os maps show another plot, also known as Fox Covert, this has an area of about 5 acres and is situated to the east of Woodborough and close to the Epperstone by-pass. It is not known if the plot near to Epperstone is part of an ancient forest or not. It seems that the name Fox Covert is common. Tree species include oak, ash, wych-elm, English elm, blackthorn, hazel, elderberry, and bramble. In 1924 some timber was felled following which it was allowed to re-generate naturally. However, some replanting was carried out after Dutch Elm disease killed off all the elms in the early 1970's and early 1980's and ash, lime, horse chestnut and sycamore were added in 1982. Each year, storms damaged the weaker trees. 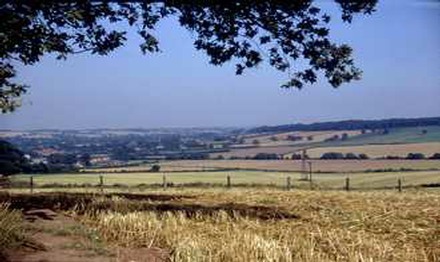 Left: A splendid view from Stanley Wood over Windmill Field towards Woodborough. Woodborough is on the centre left and Ploughman Wood on the higher ground right (1971). Right: A view of Stanley Wood from the ridge above Bank Hill Farm (1991). For many years the woods have been colonized by a large population of rooks. Other birds include the lessor and greater spotted woodpeckers, green woodpecker, tawny owl, and woodcock which is a ground nesting bird. Fox earths are to be found in the Woodborough Fox Covert where the undergrowth is more dense. In Stanley Wood there is evidence of a quarry producing grey pervious sandstone, which was used in the locality for building walls and as a foundation stone for the older properties. It is possible that some of this stone was used in the building of the church or parts of the church. The quarry is now filled in. 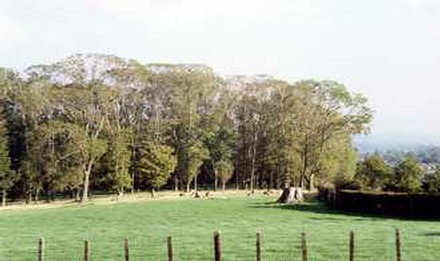 Today, (2002) the woods are thinly populated; especially Stanley Wood, and sheep graze on the woodland floor, which is now clear of undergrowth. The tall trees are still used by roosting and nesting rooks and all three species of woodpecker can be found in the decaying trees. At this time Jack Kirkham of Bank Hill Farm owns Stanley Wood and Fox Covert.